*residencies for the 2017 season will be restricted to camping but our amenities will include kitchenette, outhouse, shower and internet access. Participants are responsible for supplying their own gear but if you need camping equipment we may be able to provide some if required. Fees structures will be posted soon and for now can be discussed upon submission of proposals. Jen Pilles is a freelance illustrator currently living and adventuring in Toronto. She graduated with honors from the BAA Illustration program at Sheridan College. Her work is created using layers of gouache, watercolour and coloured pencil; it is thoughtful, cheerful, colourful and appeals to both adults and children. She loves to explore science, nature, story, myth and the human condition with her work. She creates illustrations for newspapers, magazines, websites, publishers and private clients. Jen also creates limited edition greeting cards, enamel pins, and art prints as well as self-published books and zines. She is a member of Akin Collective art studios in Toronto where she is involved in arts-related programming for the community. Jen's first children's book, High Fives at High Tide was published in April, 2016 by Pink Squid Press. Jen spent her time at Salmon River Studios as an artist-in-residence this fall, completing a series of plein-air paintings and nature studies to help inform and inspire her illustration work. This was a time for reflection and research for Jen as she immersed herself in the beauty of the Ontario countryside and explored nature - her biggest inspiration. 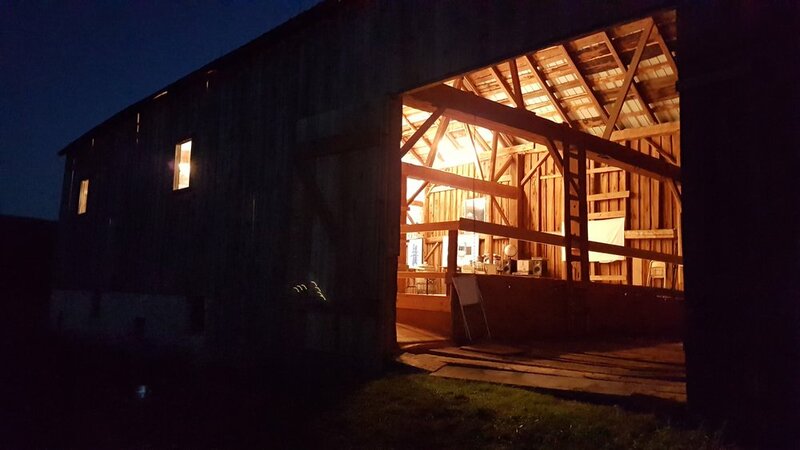 In addition to her own artistic work she co-organized in partnership with Salmon River Studios and Akin Projects a camp-out landscape painting workshop that allowed other like minded artists to join her for a portion of her stay here.